A semi-trailer hauling a load of vehicles passes a 70 mph sign westbound before the 27 road underpass on Wednesday, April 10, 2019. Colorado Department of Transportation recently changed the speed limit from 75 to 70 mph on eastbound and westbound on Interstate I-70 between mile marker 24.93 to 32.25. 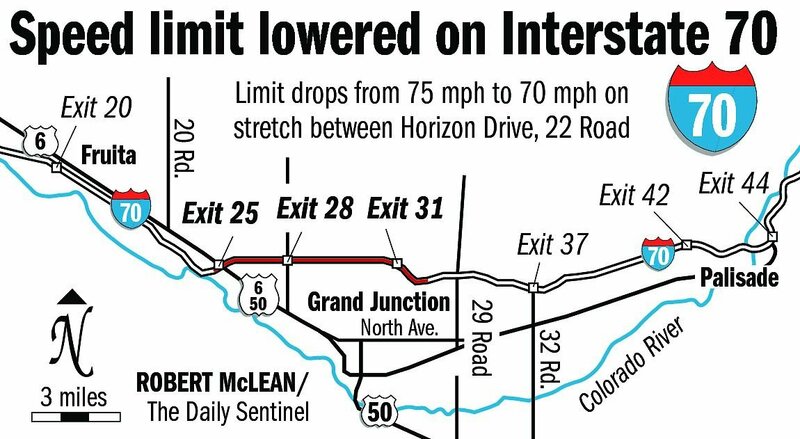 The days of zipping between major Grand Junction exits of Interstate 70 at 75 mph are officially over. Drivers now will have to settle for the less brisk 70 mph, following a recent speed limit change by the Colorado Department of Transportation. That's assuming, of course, people are obeying posted speed limits along the high-volume stretch of highway. CDOT caught local entities somewhat off guard this week when signage for the lower speed limit — in both directions between I-70 mile markers 24.93 and 32.25, or roughly 22 Road to east of the Horizon Drive exit — appeared seemingly overnight. The more than seven-mile stretch of interstate that's been slowed down spans three major local exits, at Horizon Drive, at 24 Road and at U.S. Highway 6&50. "We do have accident history through that entire area. It's an area that's becoming more and more urban, and those interchanges are becoming more and more busy," said Trent Prall, public works director for the city of Grand Junction. The new speed limit reduction is the culmination of a city effort that dates to the fall of 2017, when there were multiple fatal accidents on the sharp westbound curve approaching the Horizon Drive area. Prall said city officials met with CDOT on numerous occasions to encourage them to consider median improvements and speed reductions, with the state agency agreeing to a speed study and analysis on an accelerated timeline. A project to install new center cable rail and make guardrail enhancements in certain areas was finished last December, and the speed reduction this week is part of the overall effort to improve safety along the stretch of interstate. The safety needs extend to emergency agencies that respond to crashes and other incidents on the interstate. In one of the fall 2017 fatal crashes near Horizon Drive, a Grand Junction police vehicle was struck. "Part of the reasons we were pushing CDOT so hard for it was, it was not only about safety for our traveling public through the corridor, but also the safety of our first responders," Prall said. The Horizon Drive Business Improvement District was also among the chorus asking the city if there is anything they could do, he said. The final piece of the safety upgrades will be speed radar units — those illuminated Your Speed Is signs — which will be installed by the city in the coming weeks. Speed radar signs will be put up in the westbound lanes approaching the Horizon Drive elbow, and eastbound near the diverging diamond exit at Highway 6&50.